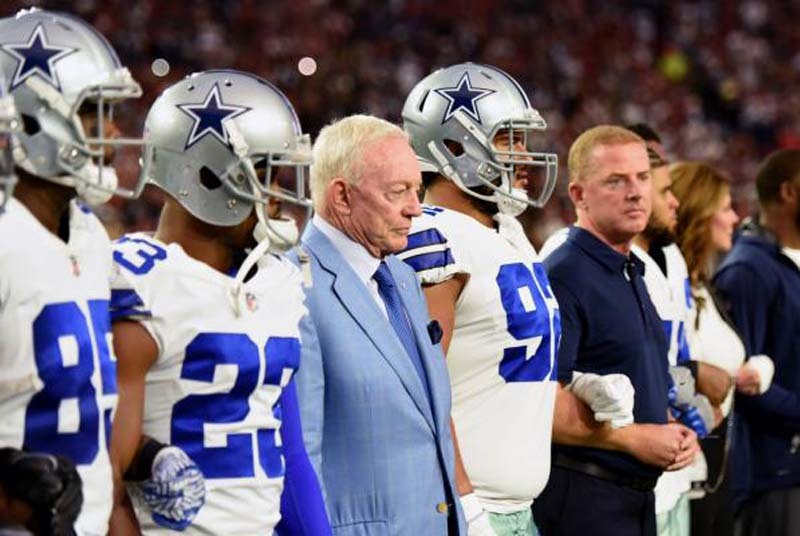 Dallas Cowboys owner Jerry Jones said Wednesday via ESPN that his team's players will be required to stand for the national anthem and not stay in the locker room prior to the game. The NFL and its players association "have come to a standstill agreement on the NFLPA's grievance and on the NFL's anthem policy," they said in a joint statement on July 19. [post_ads]The NFLPA filed a grievance on July 10 against the NFL's new national anthem policy that requires players and league personnel to either stand for the anthem or remain in the locker room. The policy also subjects teams to a fine if a player or any other personnel do not show respect for the anthem. President Donald Trump has been bashing the NFL for more than a year, since some players began kneeling during the national anthem. On Wednesday, Jones said President Trump's comments about the anthem situation have been "problematic," and added, "everybody would like it to go away."